Harvest Baking is a specialty bakery that produces premium fresh-baked goods with the best flavor and highest quality in Vietnam. We create wholesome, nutritious products that use no chemicals, extenders, additives or preservatives. These include heart-healthy options such as whole grain breads, bagels, English muffins, pitas and tortillas. We also offer healthy food choices for our gluten-intolerant and vegan customers, and we make classic favorites such as fudge brownies, homemade cookies, pies, tarts and cakes. We believe in giving back to the country and community in which we serve and operate. We do this by hiring highly motivated, underprivileged Vietnamese and working with them to develop both job skills and life skills. We are also working to prevent infant blindness Retinopathy of Prematurity (ROP). 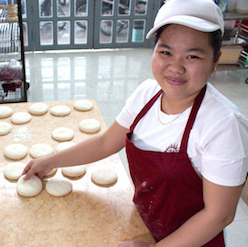 We are more than a bakery — we are a team of people committed to the health, growth and future of Vietnam.